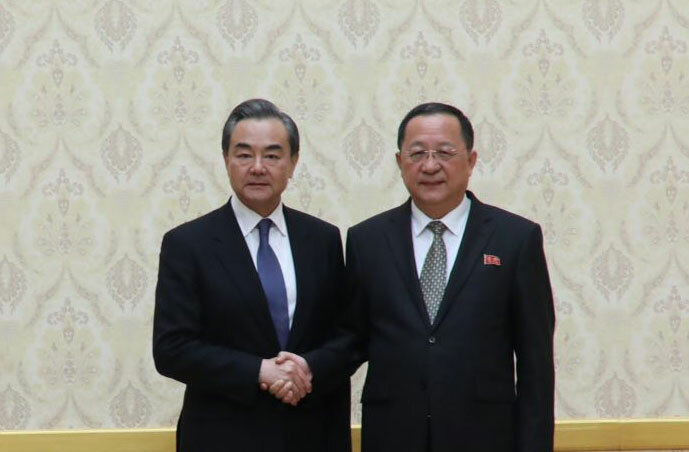 PYONGYANG - China hopes that the dialogue between the Democratic People's Republic of Korea (DPRK) and the United States will be smooth and achieve substantial progress, said visiting Chinese State Councilor and Foreign Minister Wang Yi here Wednesday. During the talks with DPRK Foreign Minister Ri Yong-ho, Wang said that China fully backs the DPRK's efforts to achieve the goal of denuclearization on the Korean Peninsula. He also said that China welcomes the successful summit meeting between the leaders of the DPRK and the Republic of Korea held on April 27 and its important outcomes. Wang recalled that DPRK top leader Kim Jong-un made a successful visit to China in March. Chinese President Xi Jinping and Kim had a historic meeting during the visit. They achieved significant consensus on continuing and developing China-DPRK traditional friendly relations, as well as enhancing strategic communication and cooperation between the two countries, t[MG_SEO]hus starting a new chapter of bilateral relations, Wang said. This will guide the two countries to consolidate and further develop bilateral relations in the new era, he said. Wang said that the traditional China-DPRK friendship is the shared and precious treasure of the two countries, adding that to continuously develop and pass on this friendship to future generations is a strategic choice of both countries. He said that China is ready to work with the DPRK to implement in substantial ways the important consensus reached by the top leaders of the two countries, by strengthening communication and coordination between their political and diplomatic organs, pushing forward pragmatic economic and trade cooperation, cultivating people-to-people and cultural exchanges, and instilling new vigor into China-DPRK relations in the new era. While speaking highly of the positive changes that have been taking place on the Korean Peninsula, Wang said that China fully backs the DPRK in its efforts to find its own development approach that is suitable to its national conditions, and to concentrate all of its efforts on carrying out economic construction. China also backs the settlement of the DPRK's security concerns, and gives its full support for the improvement of inter-Korean relations, he said. Wang added that China is willing to strengthen communication with the DPRK and continue to play a positive role in seeking a political solution to the Korean Peninsula issue. He also expressed gratitude to Kim, the Workers' Party of Korea and the DPRK government for the great attention paid to the Chinese citizens involved in a recent major traffic accident in the country, and for providing the victims with intensive treatment and relief.